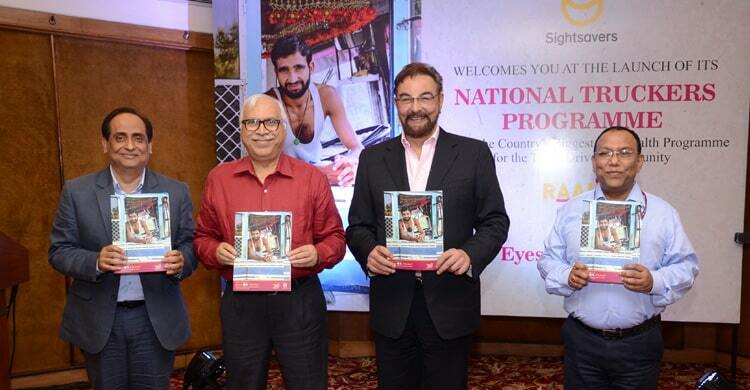 Sightsavers, a leading global development organisation working in over 30 countries to combat avoidable blindness and promote equal opportunities for visually impaired, unveiled “Eyes OK Please”, a report on National Truckers Programme, named RAAHI – Road Safety and Assurance By Healthy Eyes, in the presence of its honorary brand ambassador and internationally acclaimed actor, Shri Kabir Bedi. The programme will reach out to 500,000 truck drivers and helpers of the laborious 9 million truck drivers and transporters community present in India. This 9 million-truck driver community transports 65% of national cargo by road. With an aim to understand the situation of refractive errors and spectacle usage among truckers and transporters who were part of Sightsavers’ interventions, the study spanned across 3 years analysed vision for thousands of truckers, including a 360-degree testing of all normal visual faculties. Drawing from the research-backed insight that good vision accounts for as much as 95% of all sensory requirements to drive safely, the National Truckers Programme detects visual problems, provides spectacles or other service/ referrals. This intervention is an attempt to pre-empt visual problems among drivers, since road travel accidents have an annual death toll of 1.2 million worldwide and up to 50 million injuries. The findings corroborate an earlier study by road safety experts CSRI-CRRI and IDTR that states that drivers operating trucks have undetected eye problems and live and drive for long periods of time with these problems. The intervention for truckers is as necessary as it is missing, in the country’s road safety discourse. The data in this report comes from 235 outreach camps that Sightsavers India and its partners conducted over 10 cities in India. From April to December 2016, these eye camps screened 17,546 people. A total of 324 respondents – 268 drivers and 56 staff (including Conductors and Helpers) – from 10 cities were interviewed for this study. The average age of the drivers interviewed was found to be 44.6 years. Among the 268 drivers, 81% were truck drivers, 11.6% were bus drivers, and 7.5% drove other vehicles such as autos, private vehicles or tempos. The findings of the report states that a very high number of respondents knew that there is a problem. Nearly half, i.e., 48.5% of the respondents said they felt the need to attend the eye camp because of an eye-related problem. Of these, as many as 42.2% said they faced a problem in driving or working. It also states that the respondents have been living and driving with eye problems for as long as 8+ months, with 64.2% of the respondents saying that they were not doing anything about their eye problems. Of the 324 respondents, each one required professional eye care; with 96.6% required spectacles and 3.4% were referred for further treatment.